Please refer to our stock # 603 when inquiring. This cute Bebe look´s like an very happy and funny girl and because of her rare small size and stunning all original condition is she a treasure for each good doll collection !!! 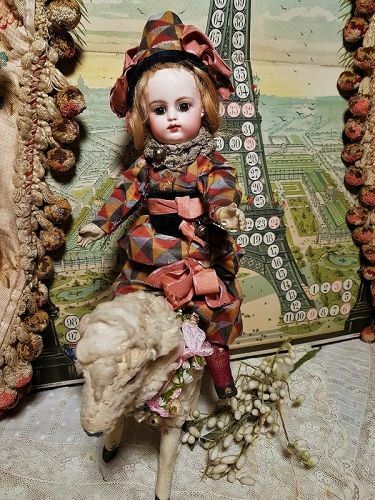 She has on fine pale pressed bisque socket head of best quality of bisque and painting with brown enamel glass paperweight inset eyes , has dark eyeliner and long painted curly lashes and widely feathered brows . Closed mouth with upturned kiss lips which are fine accented and outlined , has tiny modeled tongue and an funny dimple chin , pierced ears with earrings and her blonde original mohair wig on cork pate !! Here bisque head is in all perfect condition..... free of damage , chip , hairline or repair and from best quality !! Original five piece French composition body with original body finish , arms with straight wrists . Wearing all original color full silk satin clown dress with lace color and black velvet sash with belt . Ornate with silk bows at front , matching high bonnet with silk bow decoration , red stocking and shoes. Gauze under garment ........... The costume is sewn on the body and not possible to remove without damage .... so I think you understand that we don´t remove it because for the pictures. Small size factory original and rare to find funny block letter girl .... ready to display and enjoy ! Please understand that we offer only the doll ... all other my decoration for your inspiration ! !